Wife of the President, Aisha Buhari, has got a newly appointed Senior Special Assistant. Her name is Hajo Sani. The University of Maiduguri Class of ’78 placed an ad in the Friday, August 14th edition of Daily Trust newspaper, congratulating Sani. The buharis are just a bunch of hypocrites. What is the difference between the perks Aisha is receiving and those other ‘first ladies’ have received? Aisha…If you really want nothing to do with the presidency….why are you occupying the office patient Jonathan and other first ladies occupied in aso rock? What do you need a special assistant for? There’s no hypocrisy. It’s okay to have perks with presidency. She’s obviously the First Lady, and she’ll need what comes with that. She will need assistant in whatever her duties will be as the First Lady. Whether Aisha likes it or not, there’s still protocol that needs to be followed. Patience, ex First Lady was out of control and was literally running Aso rock. She went over and beyond the perks that comes with presidency. She abused it. I believe she’s the main person who embezzled money than her husband. She made it a duty to show off her extravagant lifestyle. She flew with unnecessary entourage whenever she traveled. She was very lousy, and unprofessional. Sorry, there’s no comparison here. This Aisha go worse pass Mama peace. I wonder oh. My problem is the initial statement top Try and diminish statement whileshe is busy planning for special assistant and her daughter is courting ngos. Just be real and accept the perks of office. A new specie of cloned Chameleon only found in Nigeria’s Sahara region. Scientists are currently tracing its origin to Daura. From Ofiice of the First Lady to Office of the Wife of the President… Nigeria, behold your Change! Ada Nnewi, presidential voluntary voltron, where are you? going in circles. What fuq is “forget what was said or not”? Why can’t we hold our leaders to their campaign promises? How then do you want them to be accountable to their deeds while in the office? That was how the issue of ‘public assets declaration’ is gradually being forgotten. What is wrong with our youths? That a president will say anything just to win an election, and afterwards some youths somewhere will tell the rest of us to forget what was said or not. This Aisha is just a hypocrite. What is the difference please!! Wife of the president or first lady all na the same. Hmmmmm my brother. I have a lot of respect for the person of Buhari. He told us there won’t office of the first lady again. All I have seen him done is the change of name but maintains status quo. Special assistants and aids appointed for her will be paid special salaries just like in the days Jonathan, Obasanjo, Yar’Adua, Babangida and the rest. What really is the difference? (change) then. When a rat eats you up and blow you cold air,it more dangerous than the animal who tells you I am dangerous so you arm your self! I have defended greatly for apc but its getting out of hand! Apc are indeed chameleons! Baba yi will not kill somebody. How can I defend this appointment? APC….. CHANGE…. Lmaoooooo…… Aunty Aisha has seen all the perks that former first ladies have been enjoying na, she don tell Bubu, sorry oh but I must enjoy my own, lwkm. Classic example of “don’t condemn something until you have experienced it” rahbeesh…. So these people think Nigerians are stupid. What is the difference between First Lady and Wife of the President? Reminds me of a song we used to sing in church as kids, ? ?hypocrites ?? Take a bike to a transformer, hug the transformer if you don’t like her appointment. Like it if you are a registered apc olofofo! Strictly for apv praise singers . Only a hypnotized fool will defend this quantum hypocricy! Your guys are all enemies of progress, is it because she is from the north. Hajo Sani is an intellect, with doctorate degree in public Administration and policy Analysis. Why are you against her, all this is southern mischiefs. Precisely. Her qualifications are reason why she should not be managing the schedule and handbag of the first lady. No sweetie, that’s not it. Actually I’m wondering what the duties of a Senior Special Assistant are. Is it the same as a PA? Is this the only assistant she has? Since there’s a Senior Assistant does that mean there’s also a Junior Assistant? What is their purpose? Please do not insult many intelligent people here by trying to play the nepotism card. It’s a pathetic attempt. Can you imagine the audacity??!! Southern mischief?? More like Northern delusion of grandeur. A PhD holder as a special assistant to the wife of a president who has no office or even pet projects yet? Abeg who is being mischievous here? What is she assisting with apart from carrying handbag? Her alumni needs to revoke her degree or question it…what an embarrassment!! Yall must think we are stupid!! Nigerians went out of their way and out of desperation put Buhari in power and my dear, they have every right on God’s given Earth to speak out when they see BS. Mssschew!! yall must have thunk we actually gave a hoot about APC…if not for PDP that effed up, who would have voted yall in?? yeye fowls wey no dey gree lay egg! @Habiba…We know she is very educated .Infact, she is more educated than most southerners. A lot of Northerners are equally as educated. Yes. At least they have occupied the most strategic positions in this administration, so far. The huge question remains , WHY DO NIGERIAN EDUCATIONAL INSTITUTIONS STILL ADMIT NORTHERNERS IN SCHOOLS WITH LOWER GRADES? Everyone should be treated alike. If the northerners are good enough to take up these positions , why the preferential treatment? Nigeria should scrap quota system. Let whoever is best qualified take the job and/ or university admission! Let’s create a healthy competition among our people and not quota system when it is beneficial to you. We need consistency and fairness. Who pays the salary of all these P.As and snr Special P.As (or whatever they are called)?… Tax payers, me, you….all these politicians are same. Increasing recurrent expenditures by the day while the country lacks basic infrastructure.This administration is yet to convince me that it is different from the last. Same circus different clowns! Why are you people crying blood? Aisha said she doesn’t want to be addressed as the First lady but as the Wife of the president and being the wife of the president she will do pet projects and traditional roles like getting invites to schools, hospitals, sponsoring women&children related projects, receiving visitors etc and doing all these you will need an assistant to help. If all you do is find fault biko kneel down and pray for the first family. Lol she will be worse that Patience?? Nah I think Patience never knew her limits but I’m glad Aisha realizes that as a spouse to the president you should know your limitations. Right on point. She is now a public figure by virtue of her husband’s position. She needs handlers just like you to stem all these under-information. Hajia Hajo, work son start. Big government, plenty money to share. Nigerians need to stop their enabling behavior!! Hian! this woman wey no even get Bachelors just employed a PhD as her assistant…how is that knowing your limitation? Sweetheart speak the truth….Patience and Aisha are starting to resembu. finito. God bless u @Missy J, some people just like to talk , she has certain responsibilities as expected of the wife of the President,hence the special assistant.She can never be worse than Patience, that woman takes the cake……. The office of the First Lady world wide require support to carry out its functions. Beeeeeeeeeeet, Buhari and his Aisha made it look like it was an extravaganza on the part of all former first ladies. In particular, Aisha opened that her mouth speaking half and a quarter evening school English and rubbished the office just to make PFJ look bad. Se eroju aiye? Una see world people? Hypocrisy and lies. If you tell lies, you must steal. Change Agents, this is your Change. @audi… Am not because I knew what’s up from the word , go! Gullible is one thing am not. God gave me a brain for a very good reason. 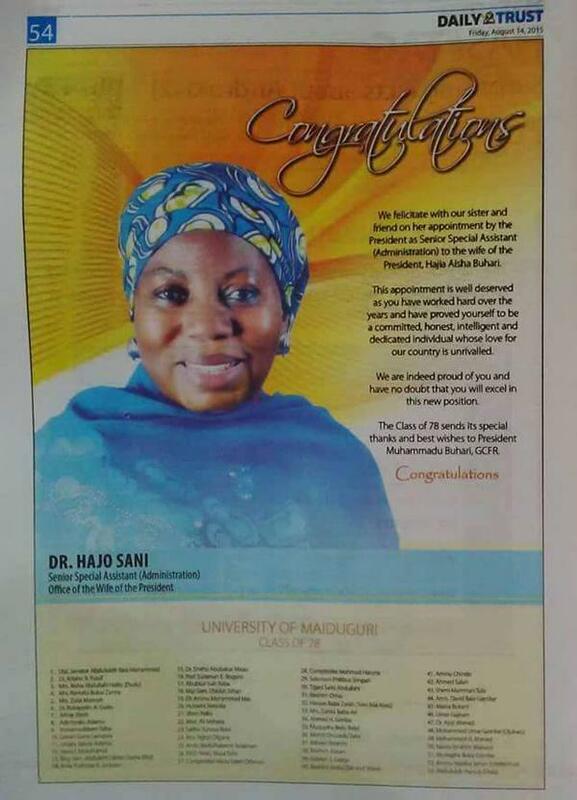 Hajo Sani was my former principal at GGSS DUTSE ABUJA , but Nne , why do SA for Aisha Buhari tho ? What’s wrong with the president’s wife having a PA. And we all know how Nigeria is …. that her classmates decided to take out an ad in the papers doesn’t mean she paid for it herself. Nigerians,all we know how to do is talk,no action…Buhari understands Nigerians a lot eehh,thats why he dosent care .he has been making only northern appointments and knows no one will do anything about it. this is something Jonathan would have never dared. I pray for Nigeria everyday sha.E go better!! Special Assistant for what exactly? To do market runs? Afterall there is no office of the The First Lady. Please can we know her job description?